Whatever happened to you that started PTSD was out of your control. That is the only way to get PTSD. It hits you! It is not something that started inside of you. It just ended up there. The fact you have PTSD means you survived something that could have killed you. Isn't it time you started to live like a survivor? You have the ability to determine your own destiny from this moment on. 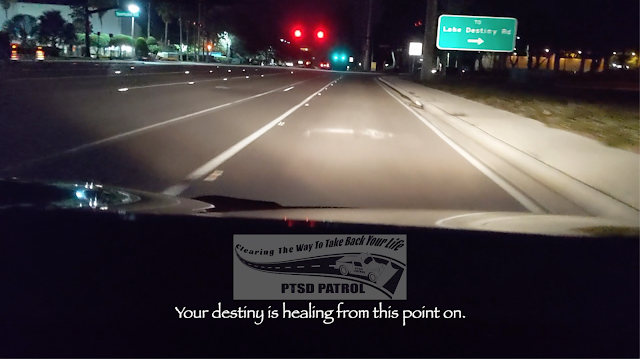 It is up to you to suffer in silence, more afraid to ask for help, than you were of what set off PTSD in the first place, or, take control of the rest of your life. Just like learning how to drive your vehicle and control it, you can learn how to drive your life and heal it. Just spend as much time discovering a new way of living instead of spending so much time suffering. It isn't easy and will take a lot of hard work. Then again, it has not been easy feeling as if all hope has vanished. I can assure you it has not. You just stopped looking for it. Personal note: I am in a lot of pain right now with my back and did not want to show it on video. I just wanted to let you know that no matter how much you are hurting, there is always something positive to find if you look for it.